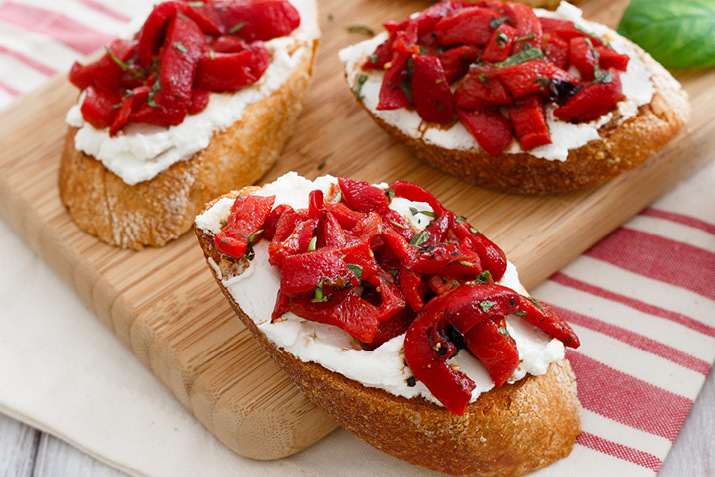 Start your grilled meal with the crunch and tang of delicious goat cheese and pepper crostini. Heat the grill to medium high. Grill the bell peppers, turning occasionally, until the skin is charred, 15 to 20 minutes. Put the peppers in a heatproof bowl or storage container, cover tightly and let sit until cool enough to handle, about 30 minutes. When cooled, scrape the skins from the peppers, then remove the stems and seeds, scraping with the back of a paring knife to clean the flesh. Cut peppers in slivers and reserve. The pepper mixture can be prepared up to 3 days ahead of time and refrigerated. Cut the baguette into 12 slices. Brush the slices with olive oil, then place on the grill for just a minute or so on each side, until crisp. Transfer to a large platter. In a large bowl, whisk the balsamic vinegar, olive oil, oregano, salt and pepper to taste. Add the peppers. Toss to coat. In a small bowl, mash the goat cheese with the yogurt and garlic until smooth, and stir in the basil. To serve, spread about 2 tablespoons of cheese on each slice of bread, then top with peppers. Serve immediately.